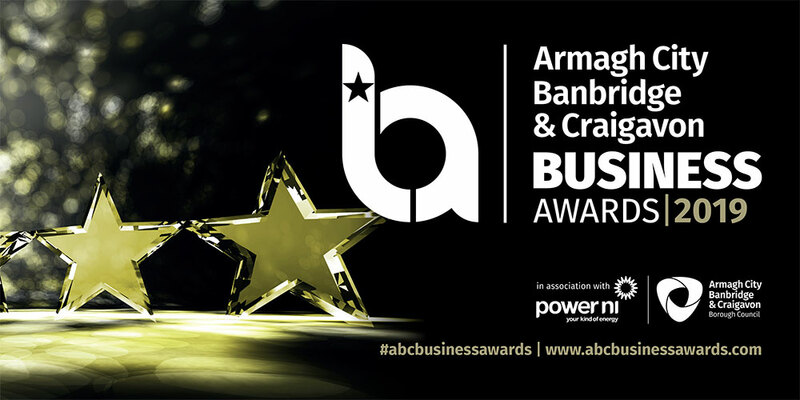 Armagh City, Banbridge & Craigavon Borough Council is delighted to announce that the ABC Business Awards will take place on Wednesday 12th June at the Craigavon Civic & Conference Centre. Entries for the awards are now open and we would encourage all local businesses to enter and get the recognition they deserve. Please note that the deadline for entries is 5:00pm on Friday 10th May 2019. Please click here to view detailed information on each of the award categories. The Business Awards give local companies the opportunity to be recognised for their hard work and commitment to business excellence. This area is home to over 8,000 businesses and growing the local economy is council’s number one priority. Our businesses are central to everything we do and it is their passion and dedication to their staff, drive to innovate and commitment to delivering world-class goods and services that sets this area apart. We are an entrepreneurial region with a wealth of exporting knowledge and our message is clear – this borough is open for business on a global basis. The Business Awards will celebrate the achievements of truly remarkable businesses and will champion our exceptional business leaders, employers, innovators and entrepreneurs from across the local economy. This award will recognise the exceptional work of young professionals or managers in any aspect of business. This category is open to all young business people, including entrepreneurs and managers, 30 years and under on 10th May 2019. Applicants will need to demonstrate the most impressive business successes in their career to date and show significant promise as a future leader in business. Applicants can put themselves forward, or be nominated by another person. The judging panel will be looking for applicants who have demonstrated a track record of young entrepreneurship. This award recognises businesses that embrace their responsibility to the environment, consumers, employees, local communities and/or other stakeholders in the public sphere with a view to celebrate the positive impact of business on the local community in the Borough of Armagh City, Banbridge and Craigavon. This award celebrates the best hospitality businesses in the Borough. The award is designed to attract applications from eating establishments such as restaurants, pubs, cafes and any form of tourism businesses and the talented individuals behind them. This award category is open to all private sector related hospitality businesses based within the Armagh City, Banbridge and Craigavon Borough Council area. *please note that all finalists will need to have a satisfactory approval rating from Environmental Health if their business serves food. This award specifically recognises excellence in manufacturing and will identify those organisations in the Borough of Armagh City, Banbridge and Craigavon which have delivered remarkable performance and results and made a significant contribution to the manufacturing and engineering sectors. Entrants will need to demonstrate that it is rooted in high quality research and development, the use of the most up-to-date equipment and processes, and is committed to developing a highly skilled workforce. This award recognises a business that can demonstrate across its organisation a commitment to providing the very highest level of customer service, and in doing so can be described as truly customer focused. The Excellence in Customer Service Award is open for applications from service providers of any size in the Armagh City, Banbridge and Craigavon Borough Council area. This award recognises the achievement, innovation and excellence of businesses large and small from the Armagh, Banbridge and Craigavon Borough Council area, in reaching new markets by exporting their products or services to areas outside of Northern Ireland. (GB and Republic of Ireland will be considered as exporting). This award has been created to encourage and recognise companies that have generated substantial and sustained increases in export activity. This award celebrates new ideas, processes, products, services, technologies and applications that have the greatest impact on an organisation’s success. This award will recognise a business that has most successfully applied innovation to their own or another organisation and can demonstrate how they have improved business results and financial performance through innovation. Briefly outline the issue the innovation was designed to resolve & how has the innovation achieved this? Evidence of how the innovation improved business performance? The Social Economy Business Award is for businesses that trade for social or environmental purposes in the community sector, the voluntary sector or the social enterprise sector. This award will recognise the outstanding work carried out by social entrepreneurs in the Borough of Armagh City, Banbridge and Craigavon and marks the contributions they have made in changing the future of their communities for the better. This award is open to all social enterprises located in Armagh City, Banbridge & Craigavon Borough Council area that have applied commercial strategies to maximise improvements in human and/or environmental well-being. This award is for businesses that have achieved demonstrable growth by implementing a growth strategy for their business within the past three years. This award is open to all businesses in the Borough of Armagh City, Banbridge and Craigavon that can demonstrate growth in one or more of the following areas; turnover, profit, staff numbers, market share and or geographic coverage. This award celebrates and recognises the achievements of established family owned businesses across all industry sectors that have successfully blended strong business acumen and family engagement. The applicants will be judged on distinctive business practices that have helped the business prosper and grow alongside the family commitment to smooth succession planning. The borough of Armagh City, Banbridge and Craigavon proactively recognises, celebrates and champions the talent, vision, dedication and achievements of inspirational women working in the borough. The council is committed to supporting and developing female professionals and entrepreneurs in all sectors of business and this award will acknowledge their outstanding achievements. Demonstration of exceptional commitment to the business and how they have inspired, enabled or supported other women inside or outside their business in a significant way. In this new category, we are looking for the best apprentice employer within the Borough. Whether you are an employer with a great scheme or an apprentice in an amazing workplace, let us know why your company deserves to win. Showcase your ongoing commitment, contribution and the success that apprenticeships have brought to your organisation. Include examples of best practice which makes your organisation’s apprenticeship programme better than the next. by 5:00 PM on Friday 10th May 2019. The Business Awards has appointed an independent delivery agent who will form the judging panel for these awards. This panel will be responsible for reviewing applications, interviewing finalists and selecting winners of each category. Stage 1 of the judging process will be to shortlist submissions based on the criteria of each category. If an applicant is shortlisted for Stage 2, they will be invited to attend a short interview / presentation with the judging panel followed by Q&A. Shortlisted finalists will be notified of their interview date and time by Tuesday 14th May. The panel will rank the shortlisted finalists based on the interview to determine the winner. Please note that if an applicant is shortlisted for stage 2 of the judging process, they must be able to attend a 15-minute interview / presentation on Wednesday 22nd May at the Craigavon Civic & Conference Centre. Businesses shortlisted will be announced on this website on Tuesday 14th May 2019. No winners will be announced until the event on Wednesday 12th June 2019. Shortlisted applicants will be required to attend a 15-minute interview/presentation on either Wednesday 22nd May at Craigavon Civic & Conference Centre. We are not able to reschedule these dates and by entering the awards the applicant is agreeing that they will be available on this date. If due to any unforeseen circumstances that a finalist cannot attend their interview, a phone call with the judges at the allocated interview time will be allowed. Any shortlisted applicants who are unable to attend or phone into the interview will automatically score a zero in this stage of the competition. Data Protection – The information you provide will be held on a database to allow processing of your entry. Your details may be used to inform you of other events and services relating to the Business Awards as well as development opportunities for local businesses that are supported by Armagh City, Banbridge & Craigavon Borough Council. If you have any further questions regarding the ABC Business Awards then please do not hesitate to contact us.